In the last few years, Software Defined Networks (SDN) and Network Functions Virtualization (NFV) have been introduced in the telecommunications world as a new way to design, deploy and manage networking services. Working together, they are able to consolidate and deliver networking components using standard IT virtualization technologies making, in such a way, Telco infrastructures more flexible and adaptive in respect to the needs of both end-users, Telco operators and service providers. 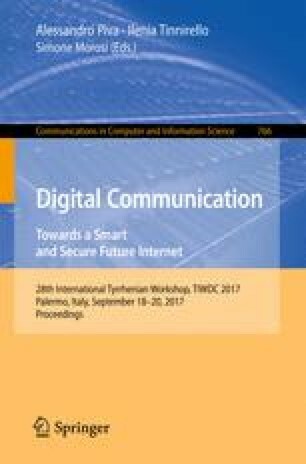 In this context, this paper presents a softwarized architecture for a multipoint remote learning service, allowing network and application functions deployment simplification and management cost reduction. In such a way, the proposed architecture enables even small/medium learning service providers to organize tele-teaching courses without the need of adopting a dedicated and expensive data delivery infrastructure. Unlike an over-the-top approach, in-network platform implementation provides flexibility and allows users, that is, students and teachers, to meet in virtual classrooms wherever they are, automatically arranging and adapting multipoint communications links at run-time according to the time-variant conditions of the underlying network and the overlay user behavior. This work was partially supported by the EU INPUT project.